This is the Volkswagen Sedric Concept. The name is a combination of the words “self-driving car” and not a weird reference to a Nissan Cedric. It’s also the “first Concept Car of the Volkswagen Group” which confuses me, since VW has had plenty of concept cars. 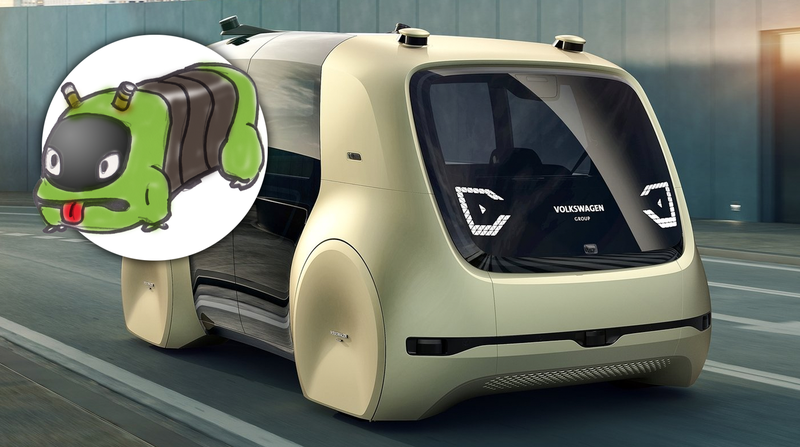 What confuses me less is the space-cyber-caterpillar look of the car, which I think makes sense for a fully autonomous car. The Sedric is a concept of an Autonomous Level 5 car, which means that no human is involved in driving the thing at all, ever. It’s not even an option. When you consider that, the strange, one-box look of the car all of a sudden starts to make sense, because, really, this is no longer a car as we understand them. It’s a robot that can take you places. And, sure, our knee-jerk reaction may be to think it looks goofy, with a contrived friendly face, but when you’re putting your life in the hands of some big machine, it’s not surprising that the overall tone and aesthetic will be one of benevolent friendliness. I’m sure at some point, somebody will hack it to talk dirty to you, too. Instead of a key, Sedric comes with a ‘button,’ a little handheld, um, button that you push to summon your loyal Sedric. The button’s LEDs change color, and it vibrates when the car-bot arrives, and is designed to be simple enough that, say, a blind person could use it with no trouble, and gain levels of personal mobility pretty much previously unknown. The Sedric is, of course, a diesel. Ha ha, just kidding! Diesel. Come on. No, the Sedric is electric, with a skateboard-like chassis containing motors and batteries, somewhat similar to Tesla, and, I suspect, nearly every other electric car likely to come out for a while. ...that’s a dead ringer for this Rinspeed concept that included a dashboard greenhouse as well. Even so, I do think they’re on the right track: autonomous cars as mobile rooms, as robots for transportation, and a general sense of being unbound by the traditions of human-driven cars.